[S604] Dave MacLeod, "Dave MacLeod to Don MacFarlane," e-mail to Donald James MACFARLANE (7), Sept 25 2006. [S731] Allan J. Gillis, "Descendants of Archibald MacIsaac." [S239] Supplementary, Archibald McIsaac and Descendants, October 15, 1914. [S709] Diocese of Antigonish, Nova Scotia, Canada , Baptismal record of Cecelia McLeod, page 399. [S709] Diocese of Antigonish, Nova Scotia, Canada , Baptismal record of Margaret Ann McLeod, page 398. [S709] Diocese of Antigonish, Nova Scotia, Canada , Baptismal record of Isabel McLeod, page 397. [S709] Diocese of Antigonish, Nova Scotia, Canada , Baptismal record of Mary Ann McLeod, page 397. [S100] Obituaries from The Casket Newspaper, 1852 - present, Obituary of Catherine (MacDonald) Coady, 69-1921-19-1. [S1005] 1921 Canada Census,Tompkins # 5782. Biography*: Andrew MacFarlane, Gentleman, who was born circa 1560 in Scotland, and died there before October 1623. He was the tenant in Kipnoch farm, Drymen Parish, Stirlingshire, Scotland for his distant cousin John, 2nd Earl of Perth, and, as a party to the feud with the Buchanans, was mentioned in the Privy Council minutes on 10 March 1619 and 25 March 1619. Andrew married with issue, five sons: he also had two natural sons." Biography*: Captain of a force of two hundred men promised by the Duke of Lennox to assist in the settlement of the "Plantation of Ulster" in Ireland. They settled in county Tyrone and many would have been Macfarlanes whose desendants would have emigrated from there to North America, Canada, Australia and New Zealand. Andrew, eldest son of Walter is mentioned as taking part in the raid upon the Colquhoun in 1543. He does not appear however to have taken an active part in the feud with that clan between 1589 and 1610, although he was held responsible for the depredations with other leaders of Clan Parlane as detailed in Chapter XV Vol 1. 'Andrew of Gartavartane' and three of his sons, Malcolm Dubh, Andrew and John Dubh, are named in Letters of Lawborrows registered in the Books of Secret Council, 1590. In 1599 Malcolm on behalf of his father and himself found sufficient cautioners to keep the peace, under pain of two thousand merks, in the persons of David Cunningham of Ibert, Walter Leckie of Easter P oldar, and William of Duchray, and in 1603 for himself and in the name of his father's brothers, he made the peace with the Colquhouns, from which the Arrochar Macfarlanes were expressly excepted. Colquhoun bound himself to stop all proceedings against the Gartartan Macfarlanes and for his part Malcolm became bound under a bond of manrent and service to Alexander Colquhoun. The details of this agreement are to be found in Vol 1 p 89. It should be observed that while Malcolm's 'father's brothers' are mentioned in this treaty his father is not named. It may be assumed therefore that Andrew died in or before 1603. Biography*: Gartartan, the most powerful and wealthest, Cadet House was founded by the only son of the second marriage of Sir Iain/John MacFarlane of that Ilk & Arrochar, 8th Chief & 11th Baron, to a daughter of Herbert, 1st Lord Herries. Walter MacFarlane of Ardleish, Tarbet, & Gartartan, 1st Baron, Tutor of Arrochar, who was born circa 1506 in Scotland, and was killed on 10 September 1547 at the battle of Pinkie Cleugh in East Lothian, Scotland. On 19 October 1529 he, as Tutor of the chief and thus exercising the latter's authority, was summonded to appear before the Privy Council with four other barons to tender advice anent restoring peace in Menteith. This indicates that his eldest brother the Chief (Andrew MacFarlane of that Ilk & Arrochar, 9th Chief & 12th Baron) was not able to act for himself. Was it at this time that Andrew made his journey to Rome? He was given extensive lands around the north end of Loch Lomond and on 17 September 1531 he received a charter to the barony of Gartartan in Perthshire from King James V., of which on 1 February 1536 he made a Precept of Sasine to his young heir, Andrew. Progenitor of the MacFarlanes of Gartartan & Ballaggan. 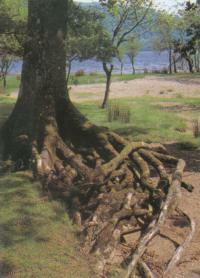 He held lease for Ardeish, a farm on the eastern shore of Loch Lomond & Stuckgown a farm about a mile south of Tarbet. He and some 200 men "well armed in shirts of mail and two-handed swords" fought with Lennox in an army supplied by King Henry VIII of England. They took the islands of Bute and Arran, defeated the Earl of Argyll, and burned down the castles of Rothesay and Dunoon. However when they attempted to take Dumbarton Castle they were defeated. Walter was fortunate to recieve an indulgance of 3000 pounds. 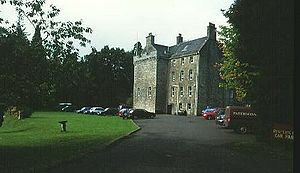 This was provided by Andrew, Lord Evandale, Henry, Lord Methven and Sir John Hamilton of Finnart. Walter fell with his nephew, Duncan, the thirteenth Chief, together with many clan bowmen, 10,000 nobles, lairds and common men at the Battle of Pinkie in 1547. The founder of the Gartartan family was Walter of Ardleish, third son of John, the 11th Chief. His mother was a daughter of Herbert, Lord Herries. Walter had several sons, Andrew Dubh, who succeeded him; one unnamed who received from his father the estate of Dulator, near Port of Monteith; and possibly Malcolm Beg of Letter in Strathgartney (Loch Katrine), to whom (and his son Walter) reference is made in Vol 1 pp 96/97. The patrimony of Walter of Ardleish in the Arrochar country was the estate of Stuckdown (Stuckgowan? ), Tarbet; the Gartartan (anciently part of Vartane) lands near Gartmore in West Perthshire being acquired in 1551 from John Lyle:.. of the reason for the description 'of Ardleish' we have no record. His adventures in the Lennox and his exploits during the Lennox/Glencairn rebellion during the minority of Mary, Queen of Scots, are described in Chapt. X1V Vol 1. It may be noted that his nephew, Duncan 13th Chief, chose Walter as his regent at Arrochar when he himself was absent 'upon the war path'. Both fell at the fatal Battle of Pinkie in 1547. As to Walter of Ardleish & Tarbet being third son of (Sir) John (who we are agreed was not Sir & did not fall at Flodden) the Historians cause confusion by calling him "first son by daughter of Lord Herries but she was a second wife. The elder two sons, by a daughter of James Lord Hamilton, were Andrew (the Wizard) 12th chief and Robert of "Inversnait". Your point is a good one regarding the third son getting such a good "bit" but the same, or similar remark would apply to Gartartan. I expect the Herries lady had money or her people drove a hard bargain. There is a record of a Campbell wife getting all the land from Stronafyne to Gordon [Gorton] as tocher or jointure. Anyhow this Walter was a fine fellow. He was in command of 140 men with Lennox and Glencairn in the taking of Bute and Arran, in time of Mary Queen of Scots and in this connection there is a promontory beside Millport called MacFarlane point or some such name. I have wondered if this has any association with this campaign. Biography*: Clan Galbraith is a Scottish clan. The clan does not have a chief recognised by the Lord Lyon King of Arms. Because of this, the clan is considered an armigerous clan, and as such Clan Galbraith has no standing under Scots Law. The clan-name of Galbraith is of Gaelic origin, however its meaning denotes the bearer as of British origin, as opposed to Gaelic. The early Galbraiths were centred in the Lennox district, which spans the Highland and Lowland border of Scotland. 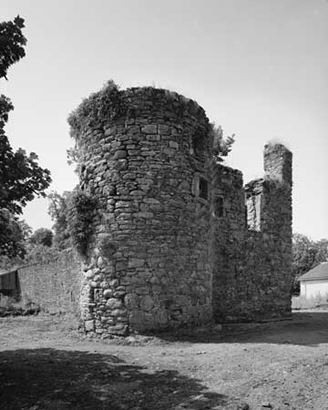 The 17th chief of the clan brought ruin to the clan in the late 16th and early 17th century, and eventually lost his lands and fled Scotland for Ireland. His grandson, the 19th chief, was the last chief of Clan Galbraith. The surname Galbraith is of Gaelic origin. The name is derived from the elements gall ("stranger") + Breathnach ("Briton"), meaning "British foreigner". The elements used in the surname would denote the differences between the Gaels —who have been generally thought to have begun migration to Scotland in about the 5th century— and the native Welsh speaking Britons, particularly the those of the Kingdom of Strathclyde. The Strathclyde Britons remained a distinct ethnic group from both the Highland Gaels and Lowland Angles until the 14th century. The former capital of the Kingdom of Strathclyde was Dumbarton ("Fortress of the Britons"), in the Lennox. In Scottish Gaelic the Galbraiths are called Breatanuich or Clann-a-Breatannuich, meaning "Britons" and "Children of the Britons". The early Galbraiths held lands in the Lennox, in the area of Loch Lomond, north of Dumbarton. The stronghold of these early Galbraiths was on the island of Inchgalbraith which is located on west side of Loch Lomond about 2 miles south-east of Luss. The heraldist Iain Moncreiffe of that Ilk speculated that the Arms of the Galbraiths —which bore three bears' heads— may allude to the British name Arthur that is thought by some to mean "bear"
The man who is considered to be first chief of Clan Galbraith was Gilchrist Bretnach who married the granddaughter of the first Earl of Lennox. The fourth chief, Sir William Galbraith of Buthernock, married a sister of "Black Comyn" who was head of the most powerful family in Scotland at the time. Sir William, however, sided against the Comyns when he had a part in the rescue the boy king Alexander III from Comyn's control. Ultimately Sir William rose in power to becoming one of the co-Regents of Scotland in 1255. Sir William's son, the fifth chief of the clan, Sir Arthur, supported Robert the Bruce, and also married a sister of Sir James Douglas. 'Good Sir James Douglas' is famous for perishing in Spain against the Saracens, while leading a small band of Scottish knights carrying Bruce's heart to the Holy Land. A branch of the Galbraiths held Culcreuch in Strathendrick in 1320, and before the end of that century had inherited the leadership of the clan. In 1425 the ninth chief James Galbraith of Culcreuch joined the rebellion of James Mor Stewart against King James I of Scotland, in support of the overthrown regent Murdoch Stewart, Duke of Albany. As many as 600 members of the clan were forced to flee after the failure of the revolt, exiled to Kintyre and the Isle of Gigha, where they adopted the new name of MacBhreatneaich of M'Vretny ("son of the Briton") . Clan historian James Macfarlane in 1948 correspondance states that (Sir) John "was not Sir & did not fall at Flodden"
The response of other historians was that he was probably knighted at Flodden just before the battle, as was the kings custom, in order to engender support and loyalty in the conflict ahead. SIR JOHN MACFARLANE was the son of Andrew, and therefore nephew of his contemporary, Matthew, l0th Earl of Lennox. The honour of knighthood was bestowed upon him by James IV.
" The honourable Sir John MacFarlane, lord of the same, soldier, captain of Clan Pharlane, son of Andrew, etc." This charter is the occasion of the misconception, already dealt with, in respect to Sir John being merely " Captain of the Clan," and not Chief. Matthew, the earl, and Sir John married sisters, daughters of James, Lord Hamilton, and nieces of James III. By his wife, whose name is not given. Sir John had two sons, Andrew, his heir, and Robert, who founded the branch of " Inversnait." Sir John married a second time, a daughter of Herbert, Lord Herries, by whom he had a son, Walter of Ardleish. Walter was the progenitor of the MacFarlanes of Gartartan and Ballaggan. Thirdly, Sir John married Lady Helen Stewart, daughter of John, third Earl of Athole, by whom he had a son, John, and a daughter, Grizel.
" Sir John," says the chronicler, " was a man of spirit and resolution, and accompanied King James IV. to the fatal field of Flodden, 15 14, where he lost his life fighting gallantly for king and country." [S828] James MacFarlane, History Of Clan MacFarlane, pages 49-50. Biography*: Lord Herries of Terregles (pronounced "Heh-reez of Ter-regulls'") is a title in the Peerage of Scotland. It was created in 1490 for Herbert Herries. Herbert Herries, 1st Lord Herries of Terregles was born circa 1460. He is the son of Sir David Herries of Terregles and Margaret Crichton. He married, firstly, Mariot Carlyle, daughter of Sir John Carlyle, 1st Lord Carlyle of Torthorwald. He married, secondly, Mariot Cuningham before 4 June 1493. He died from 14 January 1501/2 to 12 June 1505.